Tel Aviv was the final stop on our tour. During the morning we visited the Jaffa Institute, an impressive non-profit organization that does its best to support at-risk youth, and poor and underserved populations in the greater Tel Aviv area. The Jaffa Institute’s spokesman was Mitch Chupak, a lovely man who, even though he has been an Israeli for almost 40 years, has a Bronx accent so pronounced that some expert could probably identify which block in the Bronx Mitch grew up on. We helped out by moving cartons of food that they were preparing for distribution to needy families. We then enjoyed a lunch break in Jaffa. This ancient port commands a view northwards up the Mediterranean coast, taking in the sprawl and ever-heightening skyline of metropolitan Tel Aviv. 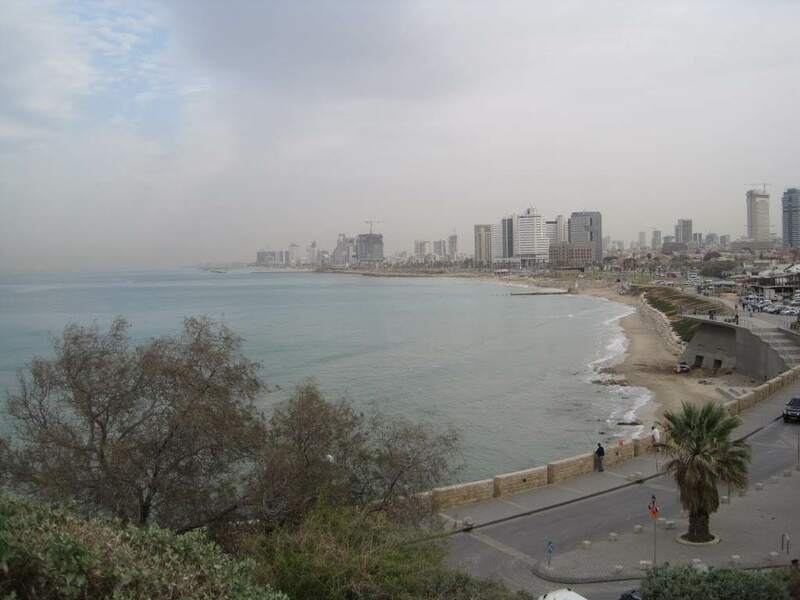 Tel Aviv celebrated its 100th anniversary in 2009; it was founded by Jewish pioneers who wanted to move out of the confines of Old Jaffa. There is a famous photograph of these founders standing on the sand dunes of their future city as they choose building plots by lottery. Today a metropolis covers every trace of those dunes. Our next stop was Independence Hall. Israel’s Independence Hall occupies the former home of Meir Dizengoff, one of those founders standing in that 1909 photograph. Dizengoff was the first mayor of Tel Aviv. After his retirement, he donated his home to be the first art museum in this young city. On May 14, 1948, the art gallery was hastily transformed into a meeting hall. Standing at the podium that day, David Ben-Gurion announced the creation of the State of Israel. The Declaration of Independence was then signed in that room, which henceforth was known as Independence Hall.The museum guide set the stage for us, and we listened to the famous tape recording of David Ben-Gurion’s declaration, and then we all stood and sang with the scratchy recording of the assembly singing Hatikvah, the Israeli national anthem: “We have not lost our hope, our hope of 2000 years, to be a free people in our own land, the land of Zion and Jerusalem.” And despite all of the problems and dangers and uncertainties, here we are. It was time for dinner before heading to the airport, but first we had an unplanned detour. One of our first-time Israel travelers, Kay Marmorek, knew that she had a prominent Zionist ancestor named Alexander Marmorek, who had a street named after him in Tel Aviv. We all agreed that we needed to find Marmorek Street so that Kay could get a photo of herself standing under the street sign.Marmorek Street, it turns out, is a major thoroughfare. Dudu found the first place where he could pull over without blocking traffic, and Kay grabbed Steve Pittelman and asked him to take her photo.They hopped off the bus. A minute later they climbed back on the bus…with Luke Brenowitz! Luke Brenowitz is the older son of Nathan Brenowitz and Laurie Schwartz, the founders of the Woodstock Jewish Congregation. Luke was the impetus for the founding of the WJC – his parents wanted a place in Woodstock where he could become Bar Mitzvah. Nathan and Laurie succeeded beyond their wildest dreams in imparting a Jewish identity to Luke. Luke recently finished his Masters in Middle Eastern Studies at Tel Aviv University, and is moving back to New York soon. So, the miracle: out of every street in Tel Aviv, we were looking for Marmorek Street. Out of the full length of Marmorek Street, we pulled over in front of the café in which Luke was sitting. Out of the 30 people on the bus that Kay could have chosen, Luke would have recognized only 3, Steve and Elise Pittelman and myself. Kay chose Steve, who is a founding member of the congregation, and whom Luke has known his whole life. When Luke climbed on the bus, I hugged him and didn’t want to let him go. He felt to me like our lucky talisman, the embodiment of why the WJC came into being, fulfilled now on a street corner in Tel Aviv. As the Kabbalah teaches, everything is imbued with purpose; life is an unfolding tapestry, and each of our lives is a purposeful thread in the pattern. On Marmorek Street that evening we were graced with a glimpse of the Mystery that weaves our lives together. In that moment, at the culmination of our journey, the Woodstock Jewish Congregation and the Land of Israel twined together and our hearts were entwined as well.